Nelcklace length：Approx 13″(33cm) + 2.8″(7cm) tail chain. Classical black lace with black rhinestone. Product photos are of the actual item you’ll be receiving; no computer generated imagery is used. It’s a wonderful gift for you and your female friends. Perfect for special events,weddings,party or just simply an evening out. 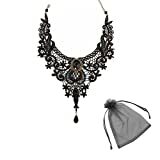 This goth style lace-up leather collar necklace is really unique and cool, which is a good choice for your fashion jewelry collection. 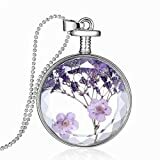 Charming necklace, unique design, great gift! This elegant style collar necklace is really unique and cool, which is a good choice for your fashion cute collection. The lengths are not adjustable.